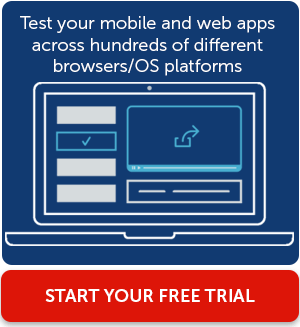 If you are a developer, software tester, or Ops engineer, the benefits of being able to test applications automatically (as opposed to relying solely on manual tests) are easy to understand. Automated testing is much faster and more scalable. It delivers deeper insights, provides much quicker feedback to development teams, and frees your team to focus on other tasks. But how do you actually make the move to automated testing? That’s a more difficult question for many teams and organizations to address. If you’re struggling to answer that question, this article is for you. Keep reading for a concise, practical guide to the steps required to begin automated testing. If you've decided to embark on your automated testing journey there are a number of steps you can take to make the transition as efficient as possible. It's like a recipe - read through all of the preparation instructions first, then go back to tackle each step. The first step in moving to automated testing is to identify which of your tests you will automate. Practically speaking, few organizations automate all of their tests. When evaluating which tests to automate, consider which ones you perform most often, as well as the user workflows that are tied to sales or purchase conversions. You’ll reap the greatest benefit from automating these first. You should also think about the extent to which a given test benefits from being performed manually. A test that involves UI features, for example, may be better to run manually because of the subjective nature of application interfaces. In contrast, tests that involve checking whether an application performs as expected in a given environment are more obvious candidates for automation. There are a variety of automated testing frameworks available. Some are open source, and some are commercial. The framework or frameworks you use will reflect the types of platforms you are testing for, as well as the ways in which you prefer to write and execute tests. Open source frameworks, of course, provide the benefit of being free and continually improved by a community of contributors. Where will you run your tests? Can your current infrastructure handle the extra load required to run tests automatically and in parallel? If it’s up to the job today, will it be able to handle more tests as you scale your test automation up? Does your team have the skills required to set up and maintain test automation software on-premises? If you’re uncertain of the answers to these questions, you might consider running tests in the cloud instead. Cloud-based automated testing grids offer unlimited scalability and turnkey test automation, as well as added-value benefits such as video recordings of each test, analytics and APIs to customize program interaction and reporting. Making the most of test automation means integrating automated tests seamlessly into your software delivery process. This requires deciding which team members will oversee tests and integrating your testing workflows with CI servers and release automation solutions. Best practices call for automatically kicked off your automated tests with each commit, providing developers with immediate feedback when a test fails. Automated tests should not only be used to speed up software quality control and delivery. They should also help you construct a continuous feedback loop that improves software quality over time. How will you collect data about test results, analyze it and feed it back to developers in order to avoid making the same mistakes repeatedly? Answer these questions as you develop your automated testing strategy. Making the move to test automation may seem intimidating if your team currently relies on manual tests. But the steps required to test automatically are not as difficult as they may first appear.